Suspended between sky and sea, in front of famous Island Li Galli, immersed in lemon and olive trees scent: pictures do not really show how gorgeous, perfectly positioned and well-designed this villa is. It is impossible, even with words, to mention how bright is the use of light and how the colours palette integrates the property perfectly with its exteriors. One can guess what a great asset is the infinity swimming pool to the rental, with its breath-taking panoramic view of Li Galli islands, Positano and the Amalfi Coasts from a large and well-manicured garden: flowers, plants, stones, and olive, apricot, cherry, and plum trees, and stones make the garden magical, creating the perfect spot where relaxing on a hammock or a sofa under the gazebo (with its refrigerator). It is also impossible to replicate the scent, and the sense of feeling finally home, away from home. The villa owner is not only a man of impeccable taste, he's also a fantastic, generous host. 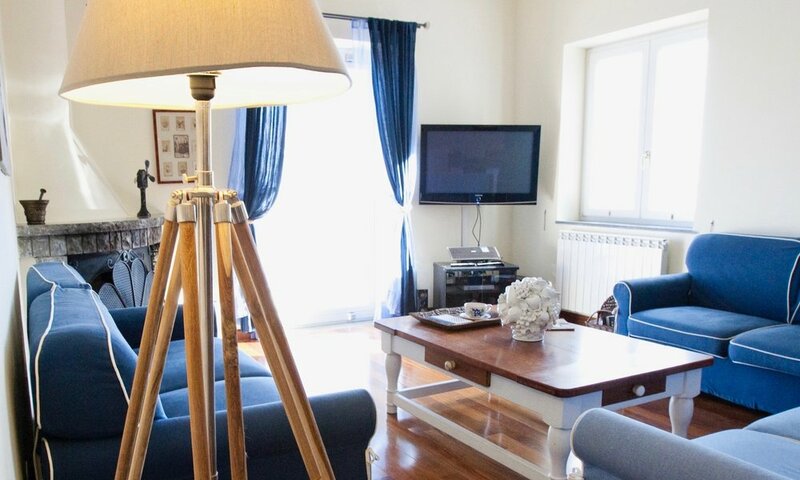 This villa, located where the enchanting Amalfi Coast begins, stands in one of the most beautiful places of the Sorrento Peninsula, a slice of heaven where sea and sky gel. Impressively, Sirenuse Islands “Li Galli” and the Mediterranean Sea are displayed right in front of the property and such views are enjoyed throughout the estate: whether guests are waking up or about to fall asleep, enjoying a cup of coffee in the living room, relaxing in the hot tub on the balcony, strolling in the villa large garden, or swimming in the gorgeous infinity pool, they can always enjoy an absolutely spectacular, breath-taking view. Fully furnished with custom made furnishing, as well as a hot tub open all year, an infinity swimming pool, outdoor kitchen, gazebo, barbecue, hammock, Sky TV, PlayStation 3, home theatre system, iPod station, alarm, fast Wi-Fi, while a special hardwood flooring is laid throughout the house. The large and beautiful kitchen (30 square meters; 323 sq. ft) can be accessed from the patio and it is fully equipped with refrigerator/freezer, six-ring gas stove, dishwasher, wine refrigerator, pots and pans, plates and silverware, American coffee maker, toaster, blender, and microwave. The dining area is adorned with a spectacularly large round table made of lava stone and a bench built into a stone wall. Throughout the house, one can enjoy beautiful sea-view, classical and modern paintings mix well with few antiques, whereas 100% Egyptian cotton linens and towels have been chosen for the bedrooms.